As a kid, my dad and I would often go to baseball and football games together. It was one of our favorite things to do together and it's what instilled in me my love of sports. My favorite thing about these outings was the food. At home, my mom made me eat pretty healthy, but at the ball game, with dad, there were no rules! The best were those giant pretzels with the "cheez" sauce. You know what I am talking about! Those pretzels, to me, are the epitome of game-day food. For the Conference Championship game last week, some friends of ours had a watch party and asked us all to bring football themed appetizers. I had made these pretzel bites before and was looking for a reason to make them again, so this seemed like the perfect one. To push them over the top and really pack the extra football-food punch, I threw in some cheese! But serving some sort of fake "cheese" like substance on the side didn't sounds as appetizing now as it did when I was a kid. So instead of making a cheese dip on the side, I put the cheese right in the middle of the pretzel! I even did some testing to figure out the best way to put the cheese in the middle and keep the cheese in the middle. Turns out, it's best if the cheese is frozen before you wrap it in dough, instead of cool or at room temperature. Go figure. Now if you have never made pretzels before, this might seem a little daunting. I would love to tell you how easy it is (I feel like I say everything is easy), but this can get somewhat complicated and there are a few steps involved. But they are sooooo worth it! There is nothing like a fresh, homemade pretzel. Those ball park pretzels have nothing on these bad boys! As you might have guessed, it all starts with the dough. If you have made bread or pizza crust before, pretzel dough is very similar. Mix together yeast, sugar, water, flour, salt and you've got yourself some pretzel dough! The tricky part comes after you get the dough mixed and proofed. What worked for me, is sectioning the risen dough off into 1 ounce pieces (I use a kitchen scale to get them all around 1 ounce). I then flattened the dough into a disk and placed a small piece of frozen cheese in the middle and then sealed the dough around the cheese. (Side Note: I used cheese curds because my grocery store had them, but you could use just plain cheddar cheese cubes, or your favorite hard cheese) After each dough ball was stuffed with cheese, I place it on a baking sheet to wait for it's boil. Yes, you read me right! You have to boil these little suckers in some baking soda water before you bake them. It's very similar to what you would do with bagels to get that brown crust that pretzels are known for. (Unfortunately there is no picture of this step since it was hectic enough trying to babysit pretzel balls in some boiling water). After their boil, I put them back on the baking sheet, then brushed them with some egg wash and sprinkled on that characteristic salt. Now it's time for the oven! You know they are ready when they are nice and golden brown. Some of mine split a bit to expose their white inner pretzel layer. Some even split open a bit too much and oozed out their cheese. Oops! Regardless, they were equally delicious!! I recommend serving them either right out of the oven, or at least warmed up to 300 degrees so that the cheese in the middle is a bit melty. Although my husband has some cold and said they were still good. Gahhhh...look at that cheese!!! Of course I couldn't eat these since I was on the silly Whole 30 diet, but I did watch my husband while he ate it and had him explain to me everything that he was tasting (the Whole 30 makes you do weird things). You should have seen the smile on his face when he told me how good they were. 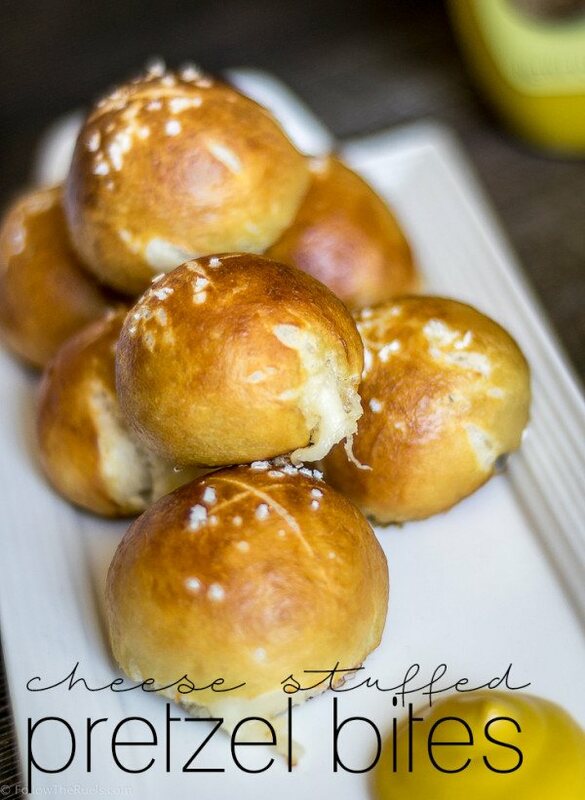 I could tell immediately without even tasting them that they were pure pretzel perfection! You better believe that I will be making these again for the Super Bowl. Everyone at our previous watch party loved and devoured them, so I know they will enjoy some more. I would highly recommend these for your Super Bowl party, too! I would encourage you to plan this out in advance, and maybe make your dough a day ahead so that you have less to do the day of. Just a suggestion! Hope you all have great Super Bowl parties and GO PANTHERS!! In the bowl of a stand mixer, combine water, sugar and stir until sugar has dissolved. Sprinkle the yeast on top. Allow to sit for 5 to 10 minutes, until the yeast begins to foam. Add in the flour, salt, and butter then mix together on low speed using the dough hook attachment. Once all the flour has been incorporated, increase to medium speed and knead until the dough forms a smooth ball and no longer sticks to the side of the bowl, approximately 5 minutes. Remove the dough from the bowl, clean the bowl and then oil it well with oil. Return the dough to the bowl, cover with plastic wrap and sit in a warm place for at least an hour until the dough has doubled in size. Preheat the oven to 450 degrees. Line a baking sheet (or 2) with parchment paper and lightly brush with oil. Set aside. Meanwhile, remove dough from bowl and place onto a clean surface. Section off 1 ounce balls of dough. Flatten each ball into a disc. Place a piece of cheese in the center of the disc and then wrap dough around the cheese. Pinch the edged together to seal in the cheese. Place onto the baking sheet. In a large pot, bring water to a boil. Add in baking soda slowly. One at a time, place dough balls into the boiling water (no more than 4-5 should be in at a time) and let sit for 30 seconds. Remove and put back onto backing sheet. In a small bowl, mix together egg yolk and water. Brush the mixture onto the tops of the boiled dough. Sprinkle with sea salt. Bake dough balls for 10-12 minutes, or until golden brown. Immediately transfer to a cooling rack to cool for 5 minutes before serving.